I was able to get the old caboose tracks/now power tracks put in this evening. As they are, I can fit 3 6-axle units, and 4 4-axle units ( 2x2 ) there. If need be, I can also store power on the leg of the wye or siding next to it as they just " fall " off the edge of the layout. 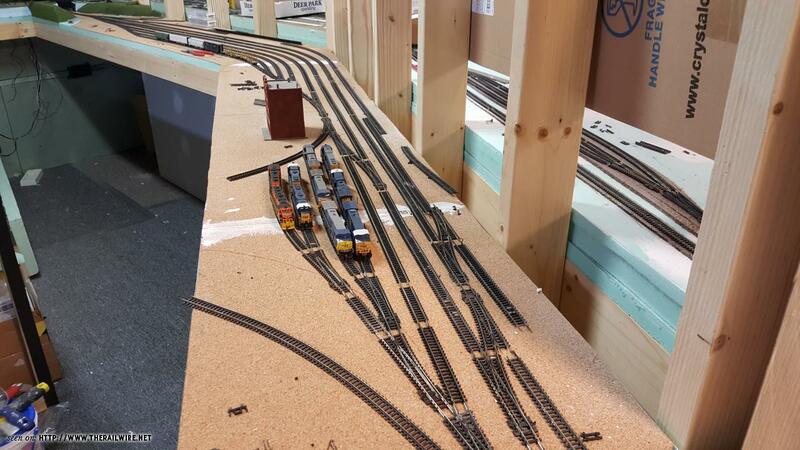 I also went back to the other end of the yard and moved some track around. I removed the short straight section from between the two turnouts and moved it to the diverging of the left. This greatly reduced the nasty S-curve I had in there. Getting that S Curve out makes a big difference. Is that the stuff to use when skim coating a patched section? My son tried to make another entrance to the kitchen and left a 2-1/2 square hole and I know the patch won't sit perfectly flush with the existing board. The key is use progressively large floating knives. 6" is generally used for the joint mud and tape. Then you can progress to larger knives for floating out the joint. Also not all mud is created equal. I generally use "hot" mud. It has a 20 minute set up time..they even make 5 minute mud. Get a good mud pan too..14" stainless steel pan. 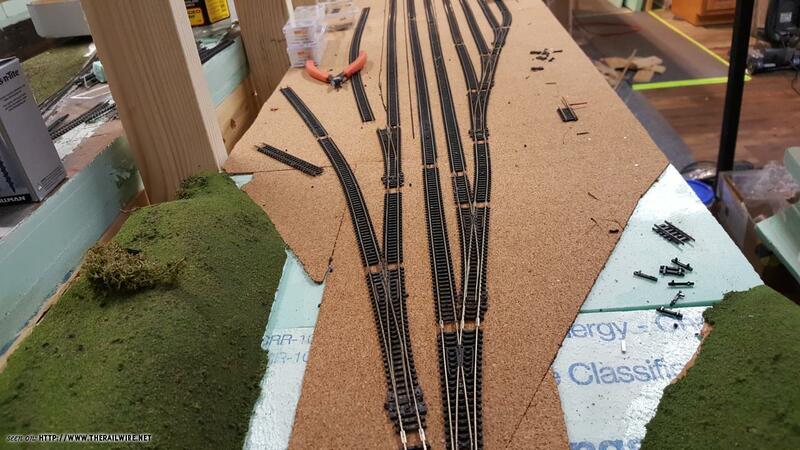 You need to take your longest locomotive or railcar and make sure you have at least that much straight track between the curved sections of track. Otherwise you still have an S curve that will present problems. 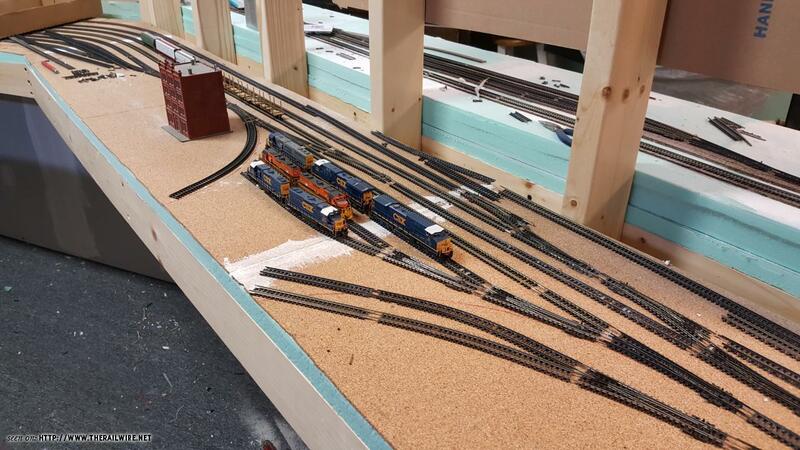 You appear to only have about 3” of straight track in front of the points of the right hand turnout. Given the amount of usage this end of the yard will get, I'm fine with the way things are. I've run strings of cars thru there from 2 bay covered hoppers to 73' Centerbeams with no issues. And while I'm waiting for the ceiling crew to free up time in their schedule, I thought something else up this evening for the second level. My first rendition of the upper level had Bittinger in the upper right corner/side. This takes up a lot of space that might be able to be used better. I drew this up quickly to think about until next weekend when we have a work session scheduled. 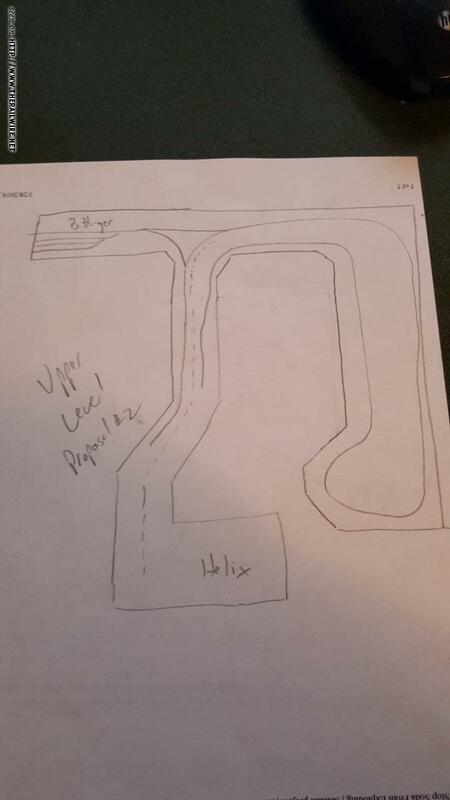 I'm thinking the new right side would be 2 different levels, maybe separated by 2" or so, front lower than back, with the back being downgrade into the turnback loop. If this were to work out, I think I'd move Morton Buildings to this new section, freeing up space for Ag Com and Dal-Tile to be spaced apart more. 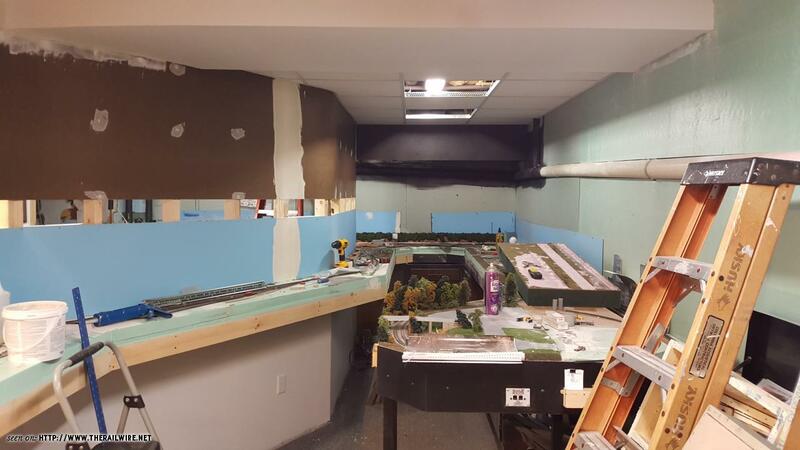 After day 1 of vacation, I've made good progress on the layout. On Sunday, we feased the idea of Bittinger on the other side and figured it would be too compressed to be a worthwhile change. Then we spent about an hour figuring out the idea for the helix even though we're not quite there yet on construction. 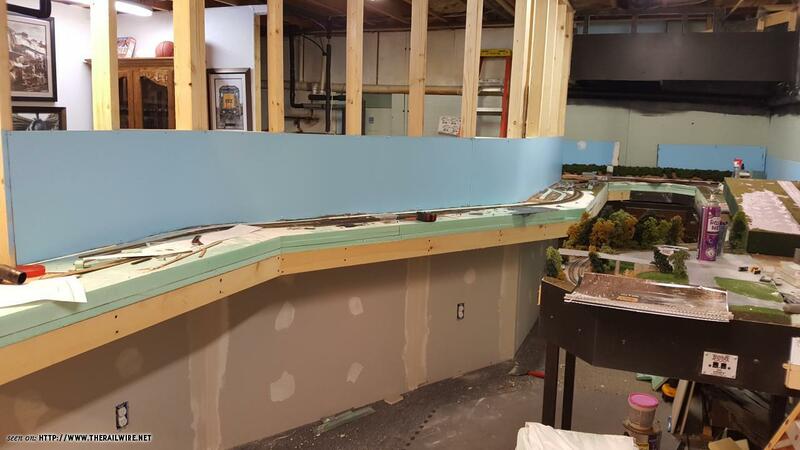 Due to how the layout will run town to town, the line will have to cross over itself somewhere, but we're fairly certain we have that figured into it already as the Hanover side is 2" higher than the Hagerstown side. More to come on that later. So then we finally set to work. Ken proposed a valance along the back wall to block out most of the window and the plumbing that drops down from the bathroom above. After another 30 minutes discussing how low to bring it, how to build it and how far out to place it, we went about actually building it. Another 30 minutes or so, we had this. 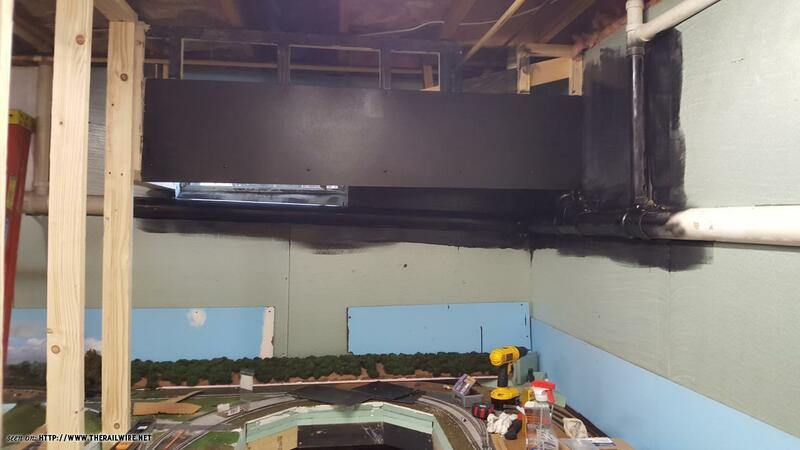 Picture was taken after I went to task painting it and part of the walls/pipes the magical flat black. Today, I made the trek to Lowes for more drywall to finish the lower section under the lower level, masonite for the backdrops and some more lumber amongst a few other things. One final thing that we discussed on Sunday was height of the second level and came to the final number of 16" between decks, having the second deck being at about eye level for me. I had Lowes cut the masonite length wise to 16", though I should have told him 16" + a blade, as the cuts came out at 15 7/8". Good thing it didn't have to be exact. I was able to get the drywall installed and mudded first coat, and lower level backdrop installed and painted this afternoon/evening. Here is where I stand at the end of day 1. Not sure what will get done tomorrow, as weather is forecasted to be nice tomorrow and possibly Wednesday but possibly some showers moving in again.